Ah.. I finally met Samantha Brown in person, and she is all I imagined her to be, and more! Samantha I am told, lives in New York City. Born in Dallas, Texas in 1969, her family moved to New Hampshire where she grew up. Samantha joined the Travel Channel in 2000 and has hosted a variety of shows, including Girl Meets Hawaii, Great Hotels, Passport To Europe, Passport to Latin America, Passport to Great Weekends,Passport To China, Samantha Brown’s First Cruise and Great Vacation Homes on the CTV Channel. For the past few years, Samantha has been traveling the United States, Europe, Latin America and now, Asia. She is famously seen hanging out in vacation homes, hopping in and out of great hotels, and even hula dancing in Hawaii. But what is she like? what makes her tick? Apparently the “Travel Goddess” loves biking, photography and her wines and she also gets her incredible sense of humor from her Dad. Apart from that she also loves movies like Cinema Paradiso and the singer Barry Manilow. Samantha’s dream vacation home would be one on the coast of Maine overlooking the sea. When we asked her, what does she like most about her travels -the food, the adventures or the people, she immediately answered “people”, as she has made many friends throughout the course of her travels and these warm friendships are what makes her life meaningful. Anyway, the reason why we got to meet Samantha (and even had dinner with her!) 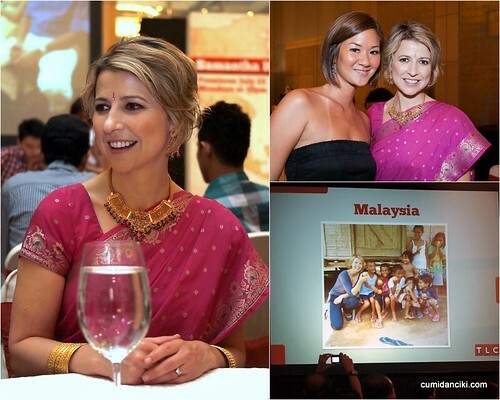 in person, is because she was in Kuala Lumpur this week, conducting her promotional tour for her latest show Samantha Brown’s Asia. This event was organized by AstroLife &TLC. Here are some scenes from the night of the event, and our short conversation with her at KL Hilton. A big thanks to AstroLife & TLC for organizing such an exciting event, so successfully. 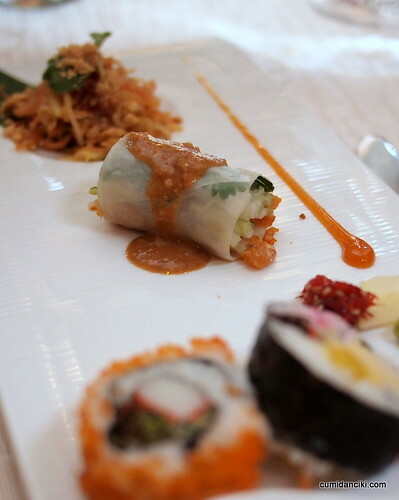 This meet Samantha Brown session happened over dinner at KL Hilton and we had a delightful “around the world” menu with starters from Thailand-Cambodia-Japan, followed by mains from Vietnam-Singapore etc, concluding with desserts from Malaysia-Bali-Hong Kong. It was pretty ingenious really and we all had a great time partaking. Regarding the new show, SAMANTHA BROWN’S ASIA premieres every Monday at 2200 hrs (10:00 p.m.), beginning July 25 on TLC (Astro Channel 707). Hopping across Southeast Asia, Hong Kong and Japan, the world traveller seeks out authentic experiences while providing travel tips and unique insights to each country she visits. Don’t miss this brand new series starting at the end of the month. Ciki meets Samantha Brown.. yay! I agree. Down to earth and fun I’d say.. Someone you could easily travel with, who would not get on your nerves! Wowwww.. so nice that you can meet her in person! I like her! 🙂 did you get her autograph? she is ! a wonderful, intelligent lady! Wow you really met Samantha – I love her show. Should have brought your Mama, naughty naughty! LOL, well nxt time mum! Fantastic! It sounds like a wonderful time. How lovely that you got to meet and speak with her. and to think that you almost gave her up for body combat cos baking is not yer thing! gufffaw. So many of you actually got the chance to meet her face to face, I’m jealous right now. Wish I was there to join you guys. I enjoy watching her shows. Lucky u, hehe! Congratulations on meeting her, I love watching her shows!Her Sari is beautiful. You’ve got such a great tan! Every day reading all the amazing stuff on your blog makes me so excited to get to meet you soon! I only wnat to know why is she wearing a Sari? if u ever visit Dallas, wouild u wear a Wonder Woman costume? is she still in malaysia?